Halve eggs. Place 1 yolk in small bowl and set aside; discard second yolk. Coarsely chop egg whites and place in medium mixing bowl. Add chicken, orange, almonds, raisins, and 3 tablespoons parsley to egg whites. Using fork, toss to combine. 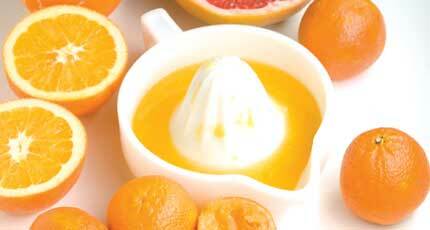 For dressing, mix orange juice with egg yolk, mashing to combine. Whisk in cinnamon, ginger, turmeric, and salt until blended. Add 4 to 5 grinds of pepper. Whisk in oil. Pour dressing over chicken mixture and toss with fork to combine. Let salad sit at room temperature for 30 minutes before serving to allow flavors to meld. Top with remaining parsley. Serving size: 1 cup. Amount per serving: 274 calories, 12g total fat (2g saturated fat), 15g carbohydrates, 27g protein, 1g dietary fiber, 319mg sodium.